More than 2,000 species of termites thrive in tropical and subtropical climates around the globe. Although less common in temperate regions, 44 species can be found in North America. You may think of them strictly as pests -- after all, they do an estimated $800 million worth of damage to buildings in the United States each year. However, these social insects play an important role decomposing and recycling dead wood. Scientists have long known termites had the ability to pick up on vibrations, but a 2007 study showed they also use vibrations to find their food. Certain termite species prefer certain types of wood, and the blind insects somehow determine what sort of wood they've found by the vibrations it emits. If nothing else, it proved termites' food choices are more sophisticated than originally thought. Scientists are hoping to use the information gathered from the ongoing studies to create a more humane pest control device. If they work out the precise vibrations termites correlate with food, they can keep termites from damaging buildings by interfering with the vibrations or otherwise sending the "wrong" signal. Finding food isn't the only use termites have for vibrations. While all species communicate using chemical secretions, some have a more basic method of communication -- they bang their heads. Termites understand the vibrations made by fellow colony members banging their heads against a hard surface as an alarm signal. This action typically is used to warn of a threat to the nest, and thousands of termites banging their heads at the same time creates a noise humans can hear from miles away. Although termites eat nothing but wood, they're unable to digest wood fibers. For that they rely on symbiotic protozoa and bacteria that live in their guts and digest the cellulose in the wood. The termites actually live off of the by-products of this digestion process -- and the bodies of the organisms. Termites aren't born with these helpers, however, so upon hatching they eat the feces of other colony members to become infected. As they grow, they molt and lose their intestinal linings, so they must reinfect themselves using the same process. Termites are eusocial insects like ants and bees, living in colonies with a queen who does all the reproducing. However, unlike those other insects, workers can be either male or female. 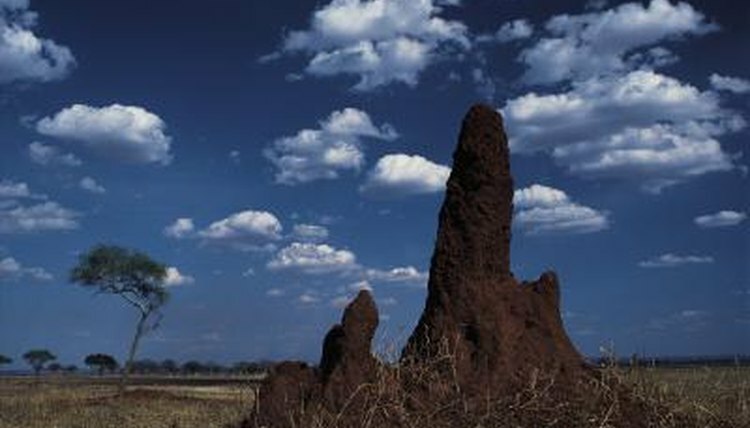 Termites experience incomplete metamorphosis, and workers are immature individuals. Adult termites have wings, and these are the reproductive members of the colony. Winged adults take seasonal mating flights, producing swarms numbering in the thousands or even millions. Males and females form pair bonds while in flight, and descend to the ground to find a suitable spot to start a nest. Once they've mated they break their own wings, never to participate in a mating flight again. The two continue to live together, however, and occasionally may remate.